Today Israel, in a humanitarian effort to help Hamas residents of Gaza, has aided Ahmed Jabari obtain the coveted of goal of 72 virgins in heaven, a goal Ahmed himself sent so many young Arabs to go seek…. But who is this Ahmed Jabari? A career Hamas terrorist who had formerly been infamous for his 9 lives, he had spent time in prison both in Israel and under Fatah (the Palestinian Authority) for terrorist activities, but always found a way to be freed. Jabari was a key architect of the Hamas takeover of the Gaza Strip from Dahlan’s Fatah security forces, and Hamas has maintained its hold on Gaza under Jabari and Ismail Haniyeh. Jabari was in effect the supreme military and terror commanded as leader of the Hamas military wing Izz ad-Din al-Qassam Brigades. In addition since Hamas is the defacto ruler of the Gaza Strip, he is Prime Minister Haniyeh’s Minister of Defense. Jabari is an extremely shadowy leader, and before Gilad Shalit’s release, it was not publicly certain if he was even alive. Israel unfortunately usually accommodates the convenient separation between Hamas’ military and political wings. This enables the leaders (who claim to lead the political side) to remain immune from Israeli reprisals against terrorist activities. The commander of the military wing on the other hand, is actively targeted (and usually killed before long) and so remains deep underground. Jabari was the architect of hundreds of attacks on Israeli civilians, the key enforcer in the Gaza takeover by Hamas and its ruthless enforcer ever since then. He was also in charge in Hamas’ weak and ineffective resistance against the IDF during Operation Cast Lead, which Israel undertook in Dec 2008 in response to ceaseless missiles and shelling at Jewish communities from Gaza (which have never stopped, only increased in range and effectiveness). His home was bombed by Israel, but he apparently escaped being targeted. In an interview with al-Hayat newspaper, Jabari bragged that most of the 477 prisoners released in the first part of the prisoner exchange (out of a total of over 1000 to be released) were collectively responsible for the deaths of 569 Israeli civilians. 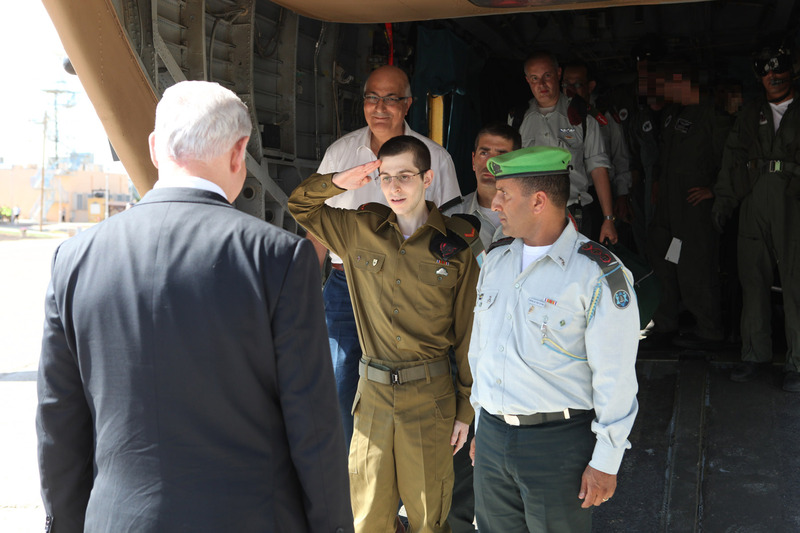 After 5 years in captivity, the tank corps soldier who had been abducted by Hamas, landed in Israel and apologized to his commander Chief of Staff Gaby Ashkenazi for being in a weak state, saluted him and PM Bibi Netanyahu, and was in turn warmly welcomed by both. We first saw some very disturbing ones. Egyptian TV wanting to also claim as much credit for Shalit’s release, breaking the terms of the release agreement, had him interviewed without choice. Gilad Shalit, who said he had not even seen people in years and was clearly not in the best shape, though he made the most of it and held himself as well as can be expected, was literally interviewed at gunpoint by Egyptian TV. The interview was more of an interrogation attempting to get Shalit to praise Egypt and condemn his country’s policies. Even though he later admitted (once in Israel) he was very afraid something could go wrong in the last minute and the release would not take place, Gilad refused to take the bait, and did the best the could in the terrible circumstances. Gilad is seen struggling to come up with the right answers and looking over the camera and reported over to his captors nervously. 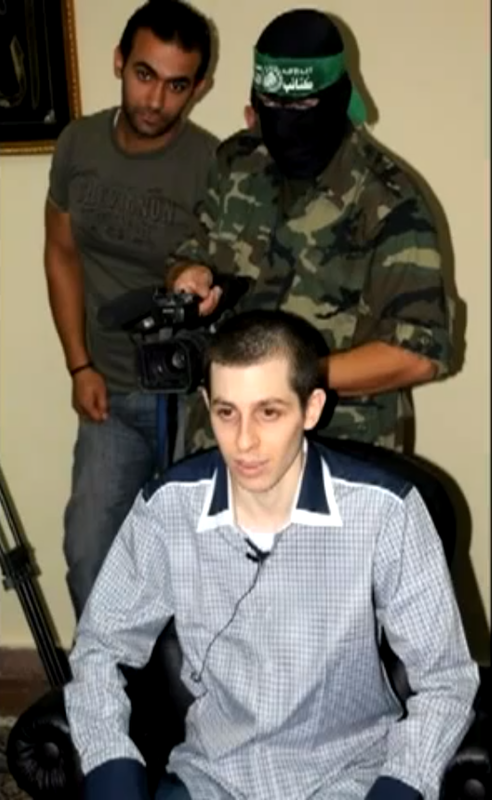 Egyptian TV “interviewed” Gilad Shalit before releasing him to Israel. In this edited frame, he is seen being held at gunpoint by Hamas during the interrogation/interview that was being used for propaganda. Shalit worried that his Hamas captors could break off the deal at the last minute, but still answered honorably despite the pressure. After this fiasco, infuriating images were seen. The shadowy Ahmed Jabari was seen in public as he basked in the aftermath of this deal. It was difficult to conceal rage as the emaciated kidnapped IDF soldier Gilad Shalit, was “escorted” by armed Hamas thugs and Egyptian officers. Jabari personally was seen on Egyptian TV along with his his fellow thugs briskly pulling and moving Gilad along. The public had not visual confirmation that Jabari was alive in years. After the exchange, Jabari was seen in public more often, gave interviews and publicly met with PM Haniyeh and other Arab officials. He vowed to continue his struggle until Israel was erased off the face of the earth. Recently, he has overseen ever increasing missile and mortar barrage of Israeli civilian communities such as Sderot near the Gaza border. He has also ordered further kidnap missions against IDF soldiers that have thus far failed. 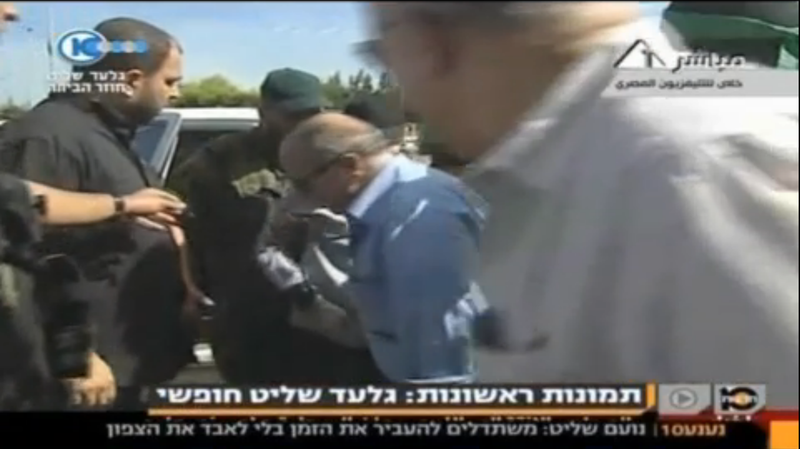 In very rare footage, Egyptian TV showed Hamas terrorist Ahmed Jabari (left of Gilad, his right), who was rumored to be dead, pushing kidnapped IDF soldier Gilad Shalit along during his transfer to Egyptian authorities and subsequently back to Israel, in exchange for the release of over 1000 Arab terrorists held in Israeli prisons. I recall when Hamas leader Sheikh Yassin was killed by Israel, the public ran around in a panic. They thought now that Israel had killed a Hamas leader, for sure Hamas would press its magic red button that says “destroy Israel”. The public often falls for the fallacy that if we strike our enemies, they might get mad; not understanding that they are already mad and doing their best to destroy us. This thinking prevails today with Iran. They foster the belief that they are not attacking at full throttle so that their leaders will not be targeted. While they are keen to send young brainwashed Arab youth to their deaths, they prefer to stay alive so they attempt to convince Israel that if they are killed, then they will really get mad. Obviously the US has never bought this argument and routinely tries to kill al-Qaeda leaders, not worried that they will “get angry” and try to destroy the US. Quite the opposite, while alive and unmolested, they will try to destroy the US. In any event, the left had convinced the Israeli public of the opposite and there was panic when the Sheikh was killed. When nothing out of the ordinary happened, the public began to learn. By the time Rantissi (co-founder with Yassin and his successor) was killed, the Israeli public had learned and cheered, and the Hamas leadership that took over would not announce it until it had moved to Syria in order to avoid being killed. Today there is a schism between Hamas leader Khaled Meshal (who is now in trouble due to the conflict of interest between his benefactor Assad, and his fellow Islamist radicals who oppose him) who fled to Syria and Hanyeh and the now late Jabari who stayed in Gaza. But the public today also cheers the death of the murderer But the public is way behind as usual. This time things are different. Though Hamas cannot do any more to Israel than it already tries to do, today they are no longer just Hamas. As I warned countless times since the very beginning of the Arab spring (no use even trying to link the many articles in which I did), Islamists have taken over Egypt. The Islamic Brotherhood and Hamas are almost one and the same. In fact, here I illustrated how Hamas, and other Jihadi elements coordinated with the Muslim Brotherhood under Mohammed Morsi to usurp Tantawi and the other Generals to obtain control over Egypt. I predict that the Egyptian response to this killing will be quite different than Mubarak’s would have been. It may begin by simple condemnation and diplomatic consequences, but Israel must be on the lookout for Egypt. Hopefully, the public will yet learn how much pieces of paper (the Camp David Sinai Accord) bought with tribute of land (the Sinai) and soldiers’ blood are worth – toilet paper. A lesson not to be forgotten before we give up the Golan Heights as well (a process that will be accelerated if Assad’s government falls). Undoubtedly, the Brotherhood will step up its efforts to arm Hamas in Gaza and retaliate more effectively. It may use this excuse to begin a process to delegitimize the Sinai treaty, and bring more troops into the Sinai (to “pacify” – which Israel all too readily fails to oppose). Ultimately this could lead to war. It is not the elimination of Jabari that may lead to war, do not misunderstand, but it is the West’s support of Islamist radical movements that are taking over governments in the region. Israel must keep her eye on the ball. Every challenge presents opportunity as well as danger. Meanwhile, Gilad Shalit, the IDF has not let you down, Ahmed Jabari at least will not be pushing you around anymore. As for Jabari, I have no evidence to know if he was a brave enemy or not, we know of no account where he led from the front, he was arrested several times and always surrendered, but he most definitely ordered hundreds of his own to their deaths and ordered or assisted the deaths of hundreds of of our own – virtually all civilians. A missile from the skies serves him well, hope he enjoys his virgins.